Set a sauté pan over medium heat and add olive oil. Once the oil is hot, add the pancetta and cook until crispy, about five to six minutes. Add the fennel and sauté until softened, two to three minutes. Add the onion and shallots and sauté, stirring often, for one minute. Add the garlic and sauté for 30 seconds. Raise the heat to medium-high and deglaze the pan with white wine. Reduce the wine until nearly evaporated, about three to four minutes. Add the tomato paste, tomatoes, salt, and crushed pepper flakes, and bring to a boil. 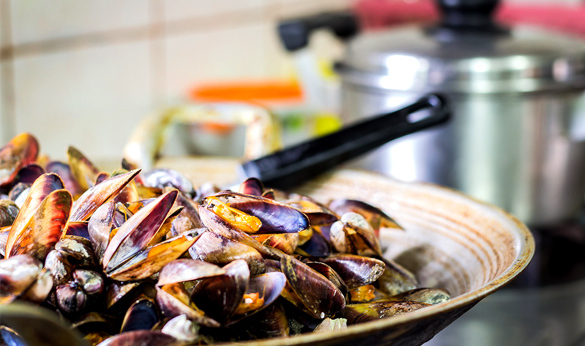 Add the mussels, cover with the lid, and cook until the mussels just begin to open about four to five minutes. Remove the lid, add the parsley and basil and stir the steamed mussels. Strain and save the cooking liquid to pour over before serving.